The 60th anniversary of the Asian-African Relations Conference has brought renewed global attention to the themes that animated the first major gathering of Asian and African heads of state in Bandung, Indonesia in 1955. At a recent commemorative gathering (19-24 April 2015), delegates from 109 Asian and African countries convened once again in Bandung and ruminated upon an ambitious agenda: “Strengthening South-South cooperation to Promote World Peace and Prosperity.” Delegates in 2015 renewed a commitment to the New Asian-African Strategic Partnership (launched in 2005 during the 50th anniversary commemoration of the first Bandung Conference), and they also worked to further initiatives in economic cooperation, most notably through the Asian-African Business Summit. The “spirit of Bandung” may have endured, but the historical context of such cooperative ventures has shifted dramatically over the decades. The 1955 Bandung Conference made history for its prominent delegations of non-Western leaders, but it was by no means the first gathering of Afro-Asian representatives for the purpose of discussing international affairs. Western and Asian intellectuals in the early decades of the 20th century had worked collaboratively through unofficial, trans-Pacific networks to encourage regional rather than narrowly national perspectives. Perhaps the most important organization in this regard was the Institute of Pacific Relations (founded 1925), which had served as the primary conduit through which academics, journalists, businesspeople and diplomats from Asia, North America, and Europe met to discuss the common challenges of the Asia-Pacific region. 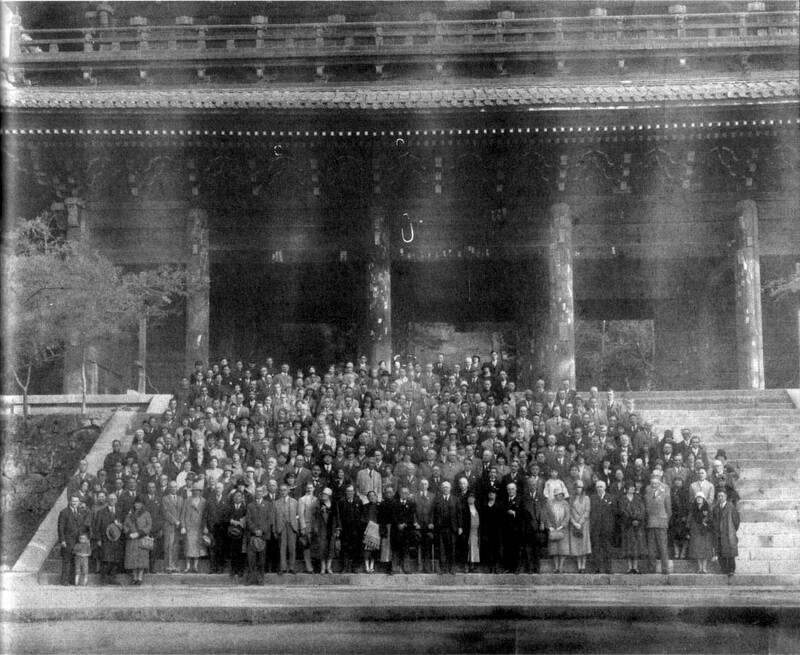 Third Conference of the Institute of Pacific Relations, Kyoto, 1929. By the end of World War II Asian groups were prepared to take the lead on organizing their own regional gatherings. 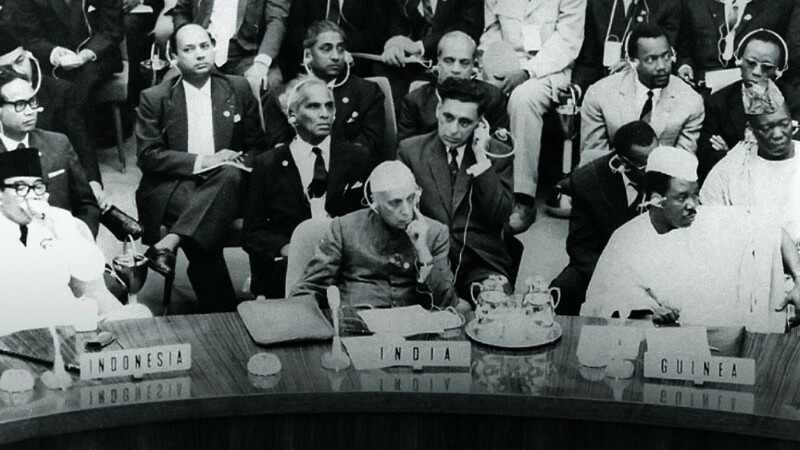 The Indian Council of World Affairs (the Institute of Pacific Relations’ Indian organizational affiliate), at the behest of Congress Party leader Jawaharlal Nehru, organized an Asian Relations Conference in New Delhi in the spring of 1947. Although the gathering was decidedly Asian rather than Pacific-centered, the proceedings explicitly borrowed from the American-dominated IPR’s long-standing conference method to bring together unofficial delegates from multiple countries to speak frankly and openly about common problems in order to achieve greater mutual understanding. The nongovernmental Asian Relations Conference of 1947 is an understudied yet important predecessor to the more famous later gathering at Bandung, not least in the complicated reaction to the gathering by Western observers. The British Commonwealth historian Nicholas Mansergh attended the Asian Relations Conference as a representative of the Royal Institute of International Affairs (Chatham House), Britain’s premier foreign policy think tank. Mansergh’s notes on the Asian Relations Conference, which he later circulated among British policymakers in the Colonial Office, reflected his estimation that the conference showcased “the awakening of a continent.” Despite the fact that Britain had not yet formally relinquished control of its Indian empire in the spring of 1947, Mansergh noted that Asian delegates showed more pity than anger toward British imperialism, which they rightly saw as a fast-fading institution on the continent. Mansergh concluded his report by finding that Asian regionalism bore no particular threat to the West, and by urging British officials to cautiously but sincerely welcome the advent of Asian collaboration as a positive development in world affairs. Mahatma Gandhi with Pt. 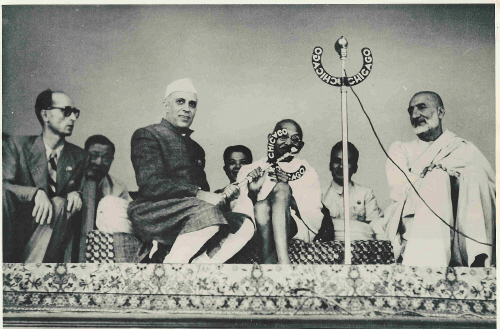 Nehru and Khan Abdul Ghaffar Khan at the Asian Relations Conference in New Delhi, April, 1948. Press Information Bureau. Asian regional cooperation elevated from unofficial exchanges to state-level talks in the midst of the 1949 Dutch “police action” in Indonesia during the last bloody months of that state’s struggle for independence. Discussion at these meetings was necessarily political in nature, as Asian governmental representatives debated how best to influence the United Nations response to the crisis. Within a few years, the deteriorating French position in Indochina prompted Asian leaders once again to renew meeting as a group. The prime minister of Ceylon, Sir John Kotelawala, took the initiative in late 1953 when he proposed a regular meeting among the leaders of India, Pakistan, Burma, Indonesia, and Ceylon. Their first gathering in Ceylon’s capital, Colombo, in the spring of 1954 witnessed considerable disagreement among the members on numerous issues, but a proposal from Indonesian President Sukarno to widen the number of participating states and to include African delegates in future regional meetings was met with wide approval. Plans for the Bandung Conference thus were set in place. Collaboration by the so-called five “Colombo Powers” aroused the concern of some Western policymakers on the eve of the Bandung conference. In early April 1955, U.S. Secretary of State John Foster Dulles contacted the British Foreign Office with a foreboding message. Dulles had detected the stirrings of a “pan-Asian movement,” and he warned his British counterparts that this growing menace was prepared to line up against the West “based on anti-colonial and racial grounds.” What Dulles feared most was the creation of an Asian “bloc” that might develop into an independent geopolitical force on the world stage. The gathering at Bandung, in his view, offered a ripe moment for this incipient bloc to take shape. [This conference] is not an exclusive club … not a bloc which seeks to oppose any other bloc. Rather it is a body of enlightened, tolerant opinion which seeks to impress on the world that all men and all countries have their place under the sun – to impress on the world that it is possible to live together, meet together, speak to each other, without losing one’s individual identity; and yet to contribute to the general understanding of matters of common concern, and to develop a true consciousness of the interdependence of men and nations for their well-being and survival on earth. The Bandung Conference’s subsequent proceedings reflected this broad-mindedness, due in no small part to the incredible diversity of political orientations and cultural backgrounds reflected in the invited states. Over the objections of the Chinese delegation, the conference agreed that “colonialism in all its manifestations is an evil which should be speedily brought to an end,” a statement broad enough to condemn both Western imperialism and Soviet-style control of satellite countries in Eastern Europe. Other elements of the conference’s final communiqué included pledges of economic and cultural co-operation, support of human rights and the self-determination of nations, and the promotion of world peace and cooperation—principles that sought to find common ground in international relations rather than inflame old animosities. John Foster Dulles’s initial impulse to view any gathering of non-Western states as a potential anti-Western coalition reflected his particular political preoccupations rather than a true reflection of the conference itself. In the end, delegates at Bandung touted “mutual cooperation” but made no plans for setting up regional machinery or any kind of exclusive arrangement that might limit contact with the West. George McTurnan Kahin, associate director of the Southeast Asia program at Cornell University, was traveling in Indonesia in the spring of 1955 and managed to secure a press pass to the conference. Kahin’s observations of Bandung led him to believe that the assertion of self-confidence by Asian and African peoples likely meant that they would have a greater determination, not less, to engage with the West in settling international problems. Cooperation among non-Western peoples, in his view, served as a stepping stone toward global communication and wider understanding among all peoples. What did Nicholas Mansergh see in New Delhi in 1947, and what did George Kahin see in Bandung in 1955, that John Foster Dulles could not? As Western observers at conferences that pointedly minimized the presence of Western delegates, Mansergh and Kahin entered a world in which the West was not the key arbiter or even the central concern of the participants. They encountered delegates whose attention was focused upon the most important event of the 20th century: not the struggle between capitalism and communism, but the transition of millions of people from a condition of colonialism into independence. They recognized quite clearly that Asian and African peoples had their own priorities and interests distinct from those of the West. Yet fundamentally, they understood that cooperation among developing states was not simply a regional matter, but one that would determine the fate of the wider world. Sixty years after the initial Bandung conference, Westerners may be even more defensive about the implications of non-Western collaboration. The Cold War has ended, yet the prospect of a multipolar world order strikes fear and uncertainty into many policymakers. Let us hope that the broad-minded “spirit” of Bandung, stressing the interdependence and mutual respect of nations and peoples, continues to inform not only Afro-Asian participants but all those who care about world peace. Dr. Anderson is director of the International Relations & Global Studies programme at the University of Texas at Austin. Tomoko Akami, Internationalizing the Pacific: The United States, Japan, and the Institute of Pacific Relations in War and Peace, 1919-1945 (London: Routledge, 2001). Indian Council on World Affairs, Asian Relations: Report of the Proceedings and Documentation of the First Asian Relations Conference, New Delhi, March April 1947, 2nd ed. (New Delhi, 2003), 1-3. P.N.S. Mansergh, “The Inter-Asian Relations Conference,” April 28, 1947, in CO 537/2092, The National Archives (TNA), Kew, United Kingdom. Foreign Office Research Department, “Asian Conferences, 1947-55,” December 2, 1955, in DO 35/6099, TNA. Report by Sir R. Makins, April 7, 1955, Washington to Foreign Office, in DO 35/6098, TNA. Participating states, in alphabetical order, included: Afghanistan, Burma, Cambodia, Ceylon, China, Egypt, Ethiopia, Gold Coast, India, Indonesia, Iraq, Japan, Jordan, Laos, Lebanon, Liberia, Libya, Nepal, Pakistan, Persia, Philippines, Saudi Arabia, Sudan, Syria, Thailand, Turkey, Vietnam (North), Vietnam (South), Yemen. Angadipuram Appadorai, The Bandung Conference (New Delhi: Indian Council of World Affairs, 1955), 12-15. George McTurnur Kahin, The Asian-African Conference, Bandung, Indonesia, April 1955 (Ithaca, NY: Cornell University Press, 1956), 1-38.